High-bandwidth signals in networking can pose several installation challenges. The balance between distance, cost, and bandwidth needs to be carefully weighed in order to ensure a stable, high performance, yet affordable system. In a world that has moved beyond 1000baseT (or 1G) to an increasingly more common 10G, 40G, and 100G requirement, the multitude of options for transmitting these signals can seem a little confusing. Here we will discuss a few common methods, as well as highlight the advantages and best-use pattern for each. A DAC (Direct Attach Copper) cable is the least expensive method for connecting between switch ports, and/or connecting network-based equipment to switch ports (such as AV over IP encoders). DACs use twin axial cabling to directly connect the copper connection from one device to another. Twin axial cabling is similar to the coaxial cabling used in your home for cable or satellite signals, except DACs are generally used to connect between a switch and a router. Additionally, they can be used to connect between a server (with a 10G SFP+ port) and a switch. This is an effective way to connect devices within an equipment rack. At TechLogix Networx, we utilize standard SFP+ ports on our AV over IP system, which means DACs can be used to connect encoders or decoders to the network switch, as long as they are in the same equipment rack. DACs are available for 1G, 10G, 25G, 40G, and 100G networks. An AOC (Active Optical Cable) is similar in use to a DAC, where the main use is connecting switch gear within a data center. However, an AOC is not a passive connection like a DAC. AOCs use matched electronics within the connectors and a fiber optic connection within the cable. This means that cable distances will exceed that of DACs. AOCs are available for 10G, 25G, 40G, and 100G networks. A transceiver is a device comprised of electronic components designed to both transmit and receive data. While transceivers are the most common type of connection method for high-bandwidth networks, we see a lot of confusion in this area due to improper terminology. 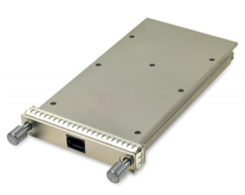 Transceivers can be used with copper and fiber optic cabling and come in several different form factors and bandwidth specifications. BICs (GigaBit Interface Converter) are the most misunderstood transceiver option, likely because the term GBIC is now used (incorrectly) as a colloquial term for any transceiver. GBIC refers to the form factor and bandwidth of the module. GBICs are available in a wide range of transmission styles including short- and long-range fiber optic, as well as copper (RJ45). Fiber optic connections use SC style connectors. The GBIC was most popular during the early 2000s but is now quite rare except in legacy equipment. SFP (1G) – SFP was the first available replacement to the GBIC. Today ‘SFP’ refers to a fiber optic connection (duplex LC connectors) with 1G available bandwidth. SFP+ (10G) – SFP+ uses the same physical dimensions and connections as SFP, with 10G available bandwidth. SFP28 (25G) – Sometimes referred to as 25G SFP, the SFP28 uses a 28G single lane connection making 25G bandwidth available. This is commonly used for connecting to TOR (Top of Rack) switches or a fanout cable. These also use the same physical dimensions as SFP. 1000BaseT SFP (1G) – These are used for connecting a 1G copper cable (RJ45) to an SFP port on a network switch. 10000BaseT SFP (10G) – Visually identical to the 1000BaseT SFP, the only difference is bandwidth (10G instead of 1G). A QSFP (Quad Small-Form Factor Pluggable) is also quite common on network switches. They are used for interconnecting switches to increase the bandwidth sharing between them. ‘Quad’ refers to the fact that these modules employ four data links instead of the single link available to an SFP or GBIC, thereby increasing total maximum bandwidth. Physically wider than the SFP, these are not interchangeable. 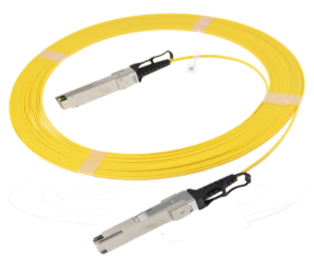 QSFP – Employs four 1G data links for a maximum bandwidth of 4GB. QSFP+ - Employs four 10G data links for a maximum bandwidth of 40GB. 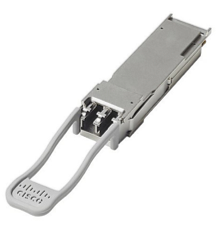 Sometimes referred to as 40G QSFP, this is the most common type seen on 10G switches. There are commonly 2, 4, or 6 of these ports to allow for switch interconnects. 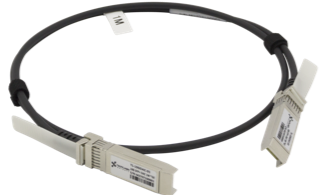 QSFP28 – Employs four 28G data links to allow for 100G bandwidth. Sometimes referred to as QSFP-100G, these transceivers are currently used for core layer switching. A CFP (C Form Factor Pluggable) is the newest addition to pluggable networking. The ‘C’ in C Form is derived from the Latin centum which refers to the 100G bandwidth for which it was primarily designed. Currently there are several different sizes (CFP, CFP2, CFP4, CFP8) which are electrically compatible, but not physically. These modules can employ either ten 10G data links or four 25G data links, but some types are capable of eight 50G data links for a single-port bandwidth of 400G. Currently utilized for core layer switching, these are the least common of the pluggable transceivers.